Pop-Up Banners are great for on-the-spot marketing that installs in seconds. With an integrated wire framework, there’s no assembly required when you take your banner out for use. Simply unfold, stake and you’re ready to go! 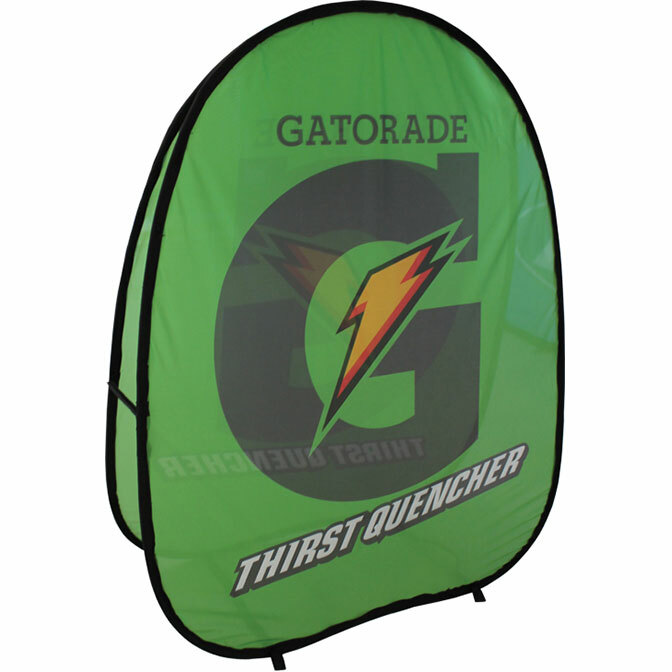 Lightweight for easy transportation, every Pop-Up Banner folds down into a carry bag that can also be used to store your banner. After removing the banner from the carrying bag, simply place it wherever you want and use light stakes to keep it in place. Fabric strips along the sides and bottom of the banner keep the banner from over-extending when open, and also give you the perfect place to stake it. Artwork can be printed on both sides of Pop-Up Banners. Through dye sublimation, inks are embedded into the fabric and won’t run or scratch off through use. Because of the lightweight fabric used to create the banner, light will shine through the banners. Send your artwork to us via the Artwork Submission Page to have us create your banner design or visit our Templates Page to download a product artwork template that you can fill in on your own.